It has been a while (about 3 months) since my last update on the Core Trainer. I have gotten rid of all of my pain (upper chest caused by the Core Trainer) and lower back (had it for 7-8 months and I finally was able to fully heal by adding a second pillow to take some of the extension out of my back while I sleep). 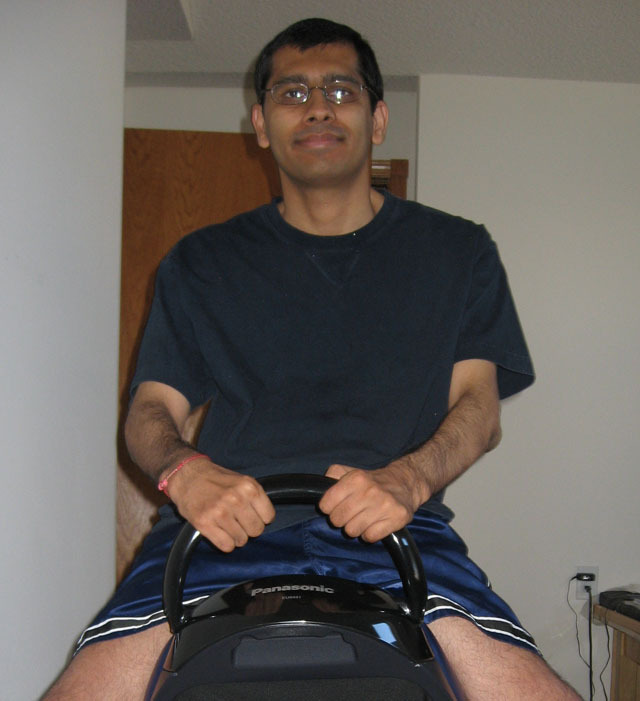 My current goal is to ride the Core Trainer for the full 15 minutes with my trunk straight. To that end, I’ve been riding the Core Trainer every other day with the tilt all the way forward (it makes an anterior pelvic tilt for full extension of my lower back easier) at the second speed setting in manual mode. I’m riding it every other day to give my muscles a chance to repair and recover. I know that I’m not exactly doing body building, but I think this is still applicable to me because I am trying to build muscle/strength as well as endurance. This seems to be working. I can stay up for a minute and repeat that about 8-10 times during the 15 minute routine. The next day, I also feel like I have more energy. I also talked about using the stir-ups in my last post. I gave that a try a couple times. I could feel my legs working a little more, but it was at the cost of my posture. In the end, I want to focus on my trunk. I don’t know what I did to myself, but even resting until Wednesday wasn’t enough. I rode for about 6 minutes in manual mode at the slowest speed and could feel the pain in my left upper pectoral towards my shoulder. I really thought I felt fine before deciding to ride it. I started to take Ibuprofen at that point and it is all I managed to do. I’m going to give it another day or two and try again. If I still have pain, I may need to go see the doctor. This week I started to have some pain in my left ribs and upper left pectoral muscle. I really felt it right after riding it Friday which makes me think I hurt it before Friday and aggravated a lot on Friday. On Thursday I had bumped the speed up to the 3rd level for the whole 15 minutes. I think this the likely culprit. I guess I simply wasn’t ready for it. I was hoping to get the speed up higher so that I could eventually get to the 5th speed level and use the preprogrammed routines at a speed higher than the lowest. I likely jumped the gun. So I did not ride it this weekend and will see how I feel tomorrow. I still want to try the stir-ups again as well. My plan is to update this blog with my progress for the next two weeks and then post updates when I have new information to share. If anyone has any questions for me, feel free to submit a comment or contact me (contact info is at the bottom of every page). Not too much to update on this week. I tried to ride it without holding the handle. You know that feeling you get when you think you’re about to lose your balance? The feeling down in your stomach? That happened to me about a dozen times in a minute or two. It was a little nerve racking, but I got through it. Today, without the handle, it was no problem. I wonder if it was psychological? I also noticed the following morning I did not have any pain in my SI joint, which is a sign of good progress. I wonder if that will be the case tomorrow? If so, then I will be riding it without the handle all week. I don’t have the strength to sit up tall without the handle however. I also can’t make use of my trick to kind of hug myself (that sounds so sad) because I then can’t use my arms to subtly help keep balanced. Also, without the handle, I noticed I was pushing into the floor somewhat. That may be a sign that I should make use of the stir-ups (maybe try and make them as long as possible) to see if I can get my legs more involved. It feels like I am really getting a lot out of the Core Trainer. I do not remember sticking with an exercise program on my own this long. I mean every day without any excuses to skip a day. It gives me some ideas for some other products. I experimented some more with the core trainer this week. I tried out all of the pre-programmed workouts and used the tilt in manual mode. 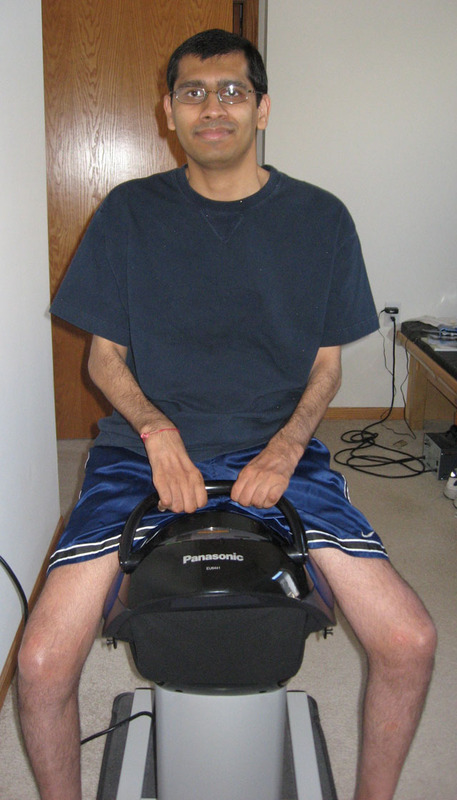 With the tilt, I found that the forward tilt made it easier for me to sit up tall longer. I’m not sure if this is better or not though. I will need to check with some people who would know if it is better to get some help to do an exercise longer or get no help and tire more quickly. The tilt backwards makes it harder to sit up. On the side to side workout (no tilt) it would be nice if you could manually adjust the tilt for the workout to something besides level. When adjusting the speed range for these workouts, the slowest one has the core trainer stay at the slower speeds (there are 9 speeds, and it stays at the first 2). If you speed it up, the range goes from the first 2 to the first 5. That’s a pretty big jump. I was expecting it to go to the first 3 to incorporate 1 more speed. I’d like to see it go 1-2, 1-3, 1-4, 1-5, 2-6, 3-7, 4-8, 5-9, 6-9, 7-9 and 8-9. I can’t handle the fastes speed, but I imagine it currently does 1-2, 1-5, 2-6, 3-7, 4-8, 5-9, and 8-9. I think I’m getting better with it since I seem to be able to keep pushing a little further each week. I also ride it without any worry. 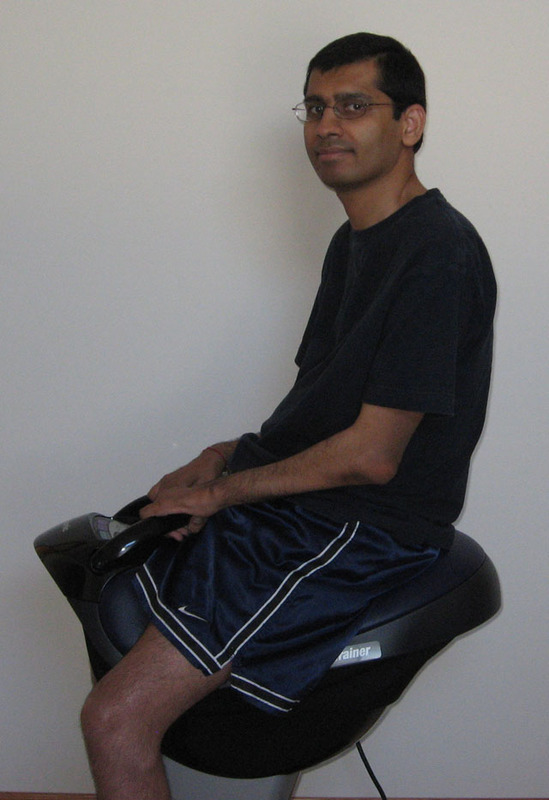 When I first started to ride it, I wore a gait belt and had someone loosely hold on. Then I stopped and someone just stood next to me just in case. Now I’m OK being left alone on it. Transferring on and off is also getting easier and quicker. Today, when I first started riding it, it felt a little different. It didn’t seem as smooth a ride at the lowest speed. It’s something I need to really pay attention to as my trial period comes to an end. I was able to get back to the full 15 minutes this week. I’m getting better as well. When I first rode it, if I closed my eyes I could feel that I was not maintaining a good position. Now I can close my eyes and stay level without a problem. I tried to use the core trainer without holding the handle. I had no problems keeping my balance, but I was also unable to sit up as tall. With the handle, I’m able to put the arch in my lower spine. I’m definitely helping myself up into that position, but once there, I can tell that I’m not holding my self there with my arms (at least for up to a minute at a time). I also tried to use the stirrups. Same result without the handle, it’s a lot harder to sit up tall. But I could also tell it did facilitated my inner thigh muscles to start working. It looks like I have more than enough room to get stronger and use this over time. I’ve found over the years that I seem to have a lot of muscles/functionality that needs to be awoken. I think it’s because I simply do not use those muscles most of the day. 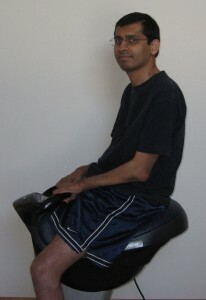 After I finish riding the core trainer, my core does feel tired. But a couple hours later I can feel that the muscles are working so much better. I think over time, that time will get longer and longer to the point where they are firing a lot more than they are not. This week I’m planning to try some of the pre-defined workouts. I think the side-to-side workout should be fine, but I have a sense that the waist and hips ones (they incorporate tilting) will be difficult and out of my current reach. I also want to time how long I can sit up tall. I needed a couple more days of rest, but I did get back to using the Core Trainer. The DVDs provided some insight on how to get the most out of the Core Trainer and there was also a small segment on its use at the Center for Spinal Cord Injury Recovery in Detroit. They showed a couple people using it briefly. I’m not sure if both of those people were tall or the unit was shorter because both of them seemed to have their feet on the ground without them coming up. My feet sometimes come off the ground while it is moving. The mirror is very helpful. I can see when I’m not level and correct it. I can also kind of target an area to try and keep my torso within so I know that I am keeping myself as straight as I can. I also stop using the Core Trainer when I can no longer stay pretty straight. The time I ride it has steadily increased over the week. I also think how long I can stay up straight (no slouching, sacral sitting) is improving. I won’t know for sure without using a stop watch or until I can do it for 3 minutes straight. The display on the Core Trainer counts down from 15 minutes with 5 LEDs, so you only know when you have less than 15, 12, 9, 6 and 3 minutes left. Getting on and off has become easier the more I do it. I’m able to do it with only one person to help now that I feel more comfortable with it (there is really just a sense that there is nothing to really hold on to, so my biggest worry is sliding off the seat.). I think the next thing I want to try is to do it without holding the handle to get a sense of the difference in difficulty. Up to now, I have always used the handle, and I think there is no way I could get rocked too much to cause me to go too far in any direction. I’m curious how much holding the handle helps me.